Light your way to clearer looking skin! With clinically proven light therapy used by dermatologists for over a decade, the mask harnesses the power of light to treat mild to moderate acne. For healthier, clearer skin, use every day! 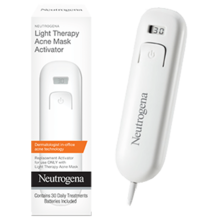 This home LED device simultaneously treats your whole face at once with both blue and red visible light - this dual-action technology helps disrupt your acne cycle and delivers clearer, healthier skin! Data on file, Johnson & Johnson Consumer Inc. 12-week clinical study, subjects with mild to moderate acne, once-daily treatment. Harnessing acne technology dermatologists use in-office, see how red and blue light work to combat 2 of the major factors that contribute to acne: bacteria and inflammation. The Light Therapy Acne Mask can be used on all skin types and is easy to use with your current daily regimen. Plug in entire activator so no silver is showing. Put mask on. Mask comes with 1 light therapy Mask + 1 Activator. The Activator is good for 30 daily treatment-sessions. Each Activator refill is good for 30 daily treatment-sessions. Mask not included.